National Night Out (NNO) is an annual community-building event to promote police-community partnerships and neighborhood camaraderie. The evening gives an opportunity to enhance the relationship between neighbors and law enforcement while bringing a true sense of community. Last year, in Rochester and Olmsted County alone there were over 83,000 people and 435 events pre-registered. Decide the type of event you would like to have: potluck, ice cream social, BBQ competition, root beer floats, etc. Get the necessary permits for noise and street closing for Rochester by calling 507-328-6890. If you live outside of Rochester, contact your city officials. Apply for a neighborhood sponsorship from Custom Alarm here! Have a blast and get to know your neighbors! At Custom Alarm we believe in protecting what matters most and your community is important, which is why we partner with local law enforcement to promote NNO each year. 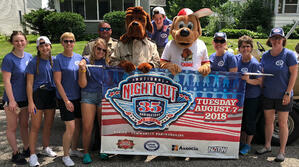 We would love to help you throw the best NNO party in your neighborhood, register for a chance at $50 toward your party.